Take 1-3 servings a day, after waking up, between meals, after workout or at bedtime. 1 portion (30g = 1 scoop) dissolve into 100 ml of water. Consume immediately after preparation. On non-workout days, drink in the morning, evening or during long breaks between meals. Consume immediately after preparation. 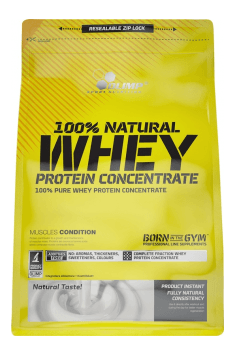 The whey protein concentrate may be used by both athletes after a training as well as by non-training people who want increase the amount of protein in the diet. The product is free of any flavoring additives and is very well absorbed. It is particularly recommended to be consumed along with carbohydrates immediately after a workout. Since it is very easy to digest and does not burden the stomach, it will work well as a snack in between the meals. What's more, the flavorless option provides an opportunity to prepare shakes or omelets that do not necessarily have to be served sweet. This type of protein is especially recommended for people who have no problems with lactose tolerance.